I spent Monday and Tuesday of this week with Lauren and Jessica. It was wonderful to have one-on-one time with two of my closest friends. That is a rare gift these days. Granted it was really one-on-one-and-a-half time. But still it was great. Jessica had just finished her first law school final and wanted to do something cheap and stress-free. 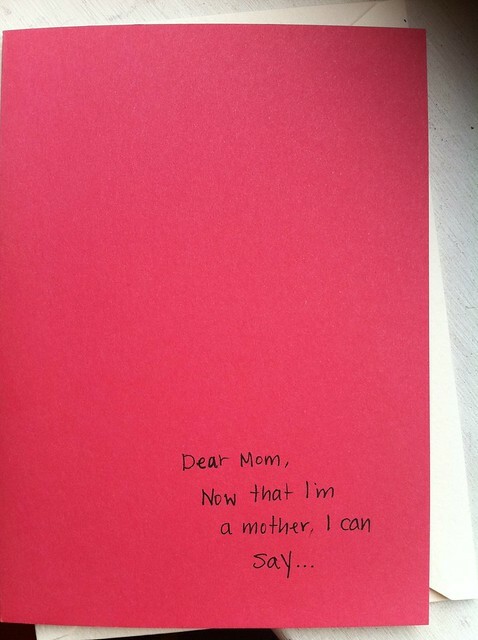 She suggested Mother’s Day cards. Perfect! I’m am the world’s worst at taking the time to make a greeting card. And at this point even sending one. Dad’s birthday is May 9th, so I created one for him, too. My dad loves the military and old books, especially old books about the military. 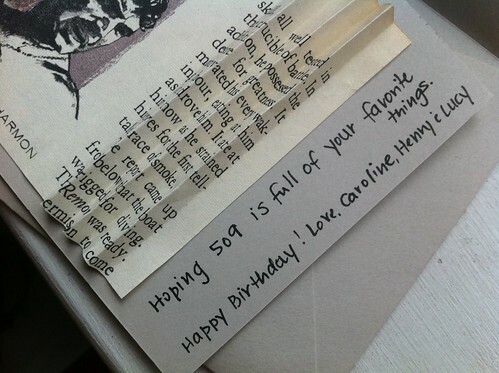 When I saw the page number 510, I realized this would be a perfect little greeting. I cut the page down to highlight the picture, folded down the corner to show his page number birthday date, and folded the text to leave space for my message. I added a little double-sided tape to paste it to a small cement flat card. Super easy. I’m not sure what he has in mind for his birthday, but I imagine his ideal would involve books. Happy Early Birthday, Dad! I think this card is beat hand-delivered a week late. Sorry to spoil the surprise. I created this card for my mom. I was using the same stack of torn out Reader’s Digest pages. I had removed them for my folded book origami practice. I’m glad I did or I probably would have never used them. Yesterday I had one thing on my mind. What has happened to Lucy’s sleep … AGAIN? Things were going so great. No more, my friend. So I was naturally drawn to this image. 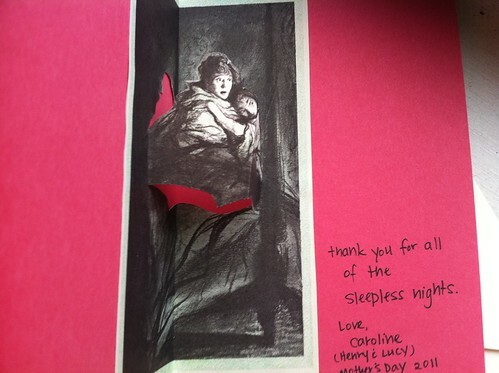 I used my Exacto knife to cut above and below the mother and daughter in bed. You need to leave plenty of room in your margin. Stop cutting at the same point on both sides of the top and bottom cuts. Don’t cut all the way around the image. You need to create a hinge by folding a straight line on both sides of the image. 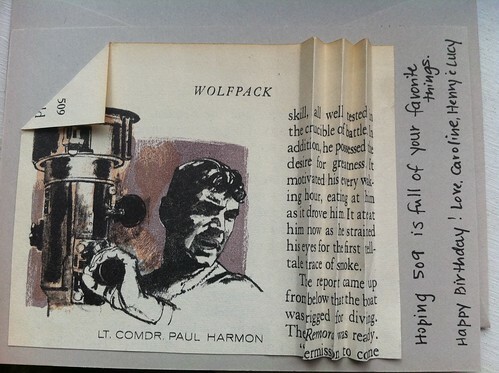 So after cutting ONLY above and below your pop-up image, fold your entire picture in half. Then fold along the edges of both side of the cut to create your hinge. Fold both folds forwards and backwards. 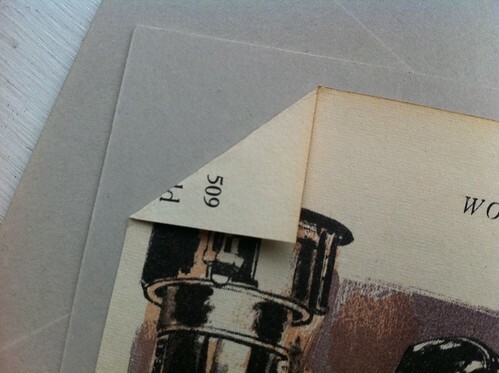 Then for your final fold, pull the image forward and flatten it all to glue it into your card. Double-sided tape works best. Firmly flatten and open. Your own little pop-up. So after writing those directions, I realize that I may not have been very clear and I really should have included pictures. That’s a great excuse to make another card! It was a fun creative exercise, which may be right at my speed right now with a little one under foot.